To gain a bit of increased awareness, Israeli travel company ISRAIR partnered with Waze, a mobile navigation app. 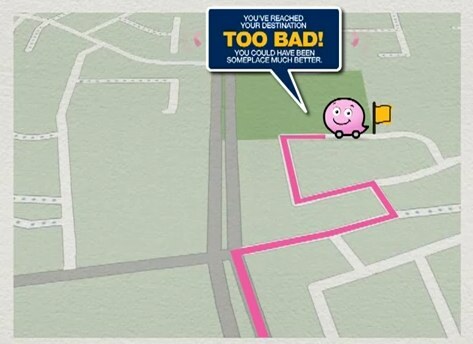 When using Waze, a little icon travels a map along a path it has determined for you. When you reach your destination, it says, "You've reached your destination." The partnership changed the destination message to read, "You've reached your destination. Too bad. You could have been someplace much better. Dial ISRAIR *2737" The customized message is said to have delivered 8 million impressions. No word on how it affected sales.